This would be the first step for me in my quest for Going Green. 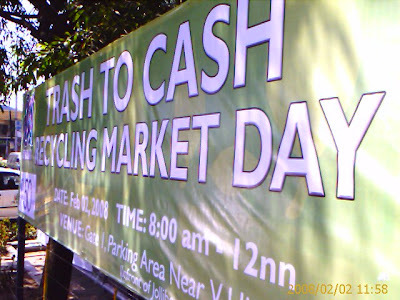 I learned about this during the Sinulog Week, there was a Big Banner talking about this Waste Market Fair thing. At first I was a bit shocked and skeptical since I was wondering if someone would really pay cash for some wasted / disregarded stuff. So I did a little research on my own about this, anything and everything related I could find. I basically stumbled on many websites about this on going “Going Green Phenomenon” and “The Green Revolution” and learned a lot from them. 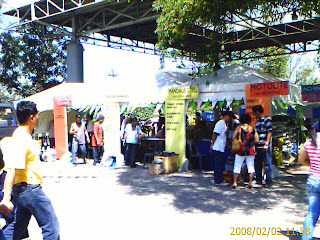 Unfortunately, some but not all of their suggestions are applicable here in the Philippines due to many factors: Low / slow awareness in schools as well as the industry (only few), not-so-strict implementation of the government’s environmental laws and basically most people here are always looking Inward, and not the Big Picture of things (take a look at our Politics). 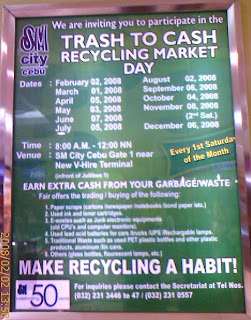 I’m not saying that the government is not doing anything, in fact the Cebu City government also lauded the Department of Environment and Natural Resources and the Philippine Business Sector for the environment through the Cebu Chamber of Commerce and Industry for spearheading the opening of a waste trading market project at SM City Cebu. Moving on, so being the Early bird that I was, I arrived @ 11:55 AM (5 minutes before the Closing time LoL) so I rushed to the registration area to register and get me a priority number. After that, they weighed my 3 feet high mixture of papers, notebook and manuals and then did some calculations and then INSTANT CASH!! 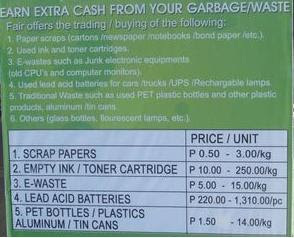 Although I didn’t earn much cash unlike my friend Carlito (He earned Php700++ from empty ink and toner cartridges) while I earned freakin’ Php15.00 for my 3+ feet high paper scraps; since I am committed to this, I can say It’s the thought that counts. Look at the bright side, I got to clean up my house with those paper clutters and I get a second chance next month and all month to horde wastes (I do not freaking care now if they call me Basurero – meaning Garbage Man in English) and as long as I get cash muwahahahaha..! This is truly a BIG STEP for Cebuanos and for Filipinos! For inquiries you may call these numbers: (032) 231-3446 or 231-0667. Reduce, Reuse and Recycle. Let's do our part and help save our home, EARTH. Fellow Cebuanos, SPREAD THE WORD!!!! We also have that here at SM Fairview. :) It's a good thing that the private sector increasingly realizes the effects that we human beings incur to our environment.